Where The Arts, Comms, Design, and Politics meet. A city of economic contrasts emerges in Cuba, and you should definitely visit. Local travelers in their classic Chevrolet at a gas-station in Viñales, juxtaposed with YouTubers making a video in the center of Old Havana. I became interested in Havana as a teenager in high school — an interest that continued through my late teens and early twenties as a graphic design major in college. Maybe it was the intrigue of the Cold War and the Revolution itself, which added to the colorful mystery of this beautiful Cuban capital city; maybe the illicitness of American travel to the island; or maybe simply the music, dance, and culture that together make Havana stand out among destinations in the Caribbean. Whatever the reason, Havana had always been on my mind. Today, something newly intriguing is happening in Havana and across Cuba. Transformation is everywhere — from privately-owned bars and restaurants, to AirBnB-listed private rentals, and towering new construction. This exciting transformation is unmistakable, but so are a number of stark contrasts. I felt both as I finally made my way around Havana, and day tripped through Viñales Valley for a week this past January. If you have never traveled to a developing country, culture shock is inevitable. Cuba is a Small Island Developing State (SID) with sustainable development challenges, and the Soviet-era socialist government appears to only be taking baby steps towards a transition economy. The Revolution is still everywhere, but Cuba is no longer the island many of our parents remember. A small emerging private sector is driving economic growth and social change across the island — change that is fueled by tourism and remittances, and creates a dichotomy between those who have consistent access to tourist and remittance dollars, and those who do not. The first thing that hit me both inside and outside of José Martí International Airport near Havana were the smells. Inside: exactly what one might expect an institutional building frozen in time to smell like. Outside: tobacco and burning sugarcane. The next thing that hit me were the heat and humidity inside the building, and the lines. As with travel to most un- and under-developed countries, you think you know, but you’re not quite prepared for the culture shock. Going through customs at Cuba is an entirely different experience from going through customs in the U.S. or Canada, and those who are not well-traveled might find it intimidating. It was hot when I arrived (and the building was not air-conditioned), the lines were long, and the processes unfamiliar. Expect to wait an hour or even much longer to get through customs and to exchange your money before beginning your journey from the airport into Havana. I stood in line for more than two hours at the currency exchange adjacent to the airport. With plenty of time to think, I found myself thinking about how easy it is for would-be travelers to lose themselves in a romantic storyline about the beauty of this unique Caribbean island and the uniquely wonderful people who call it home, while ignoring the reality of the everyday challenges Cubans still face. Canadians, Europeans, and those from other parts of the world are free to enjoy Cuba’s beautiful tourist beach resorts, but travel to Cuba is still restricted for Americans. If you are an American keen to experience the island for yourself, you can now travel on commercial flights operating from key U.S. points directly to Havana, but you must comply with one of 12 legal categories of travel, none of which allow for direct tourism. 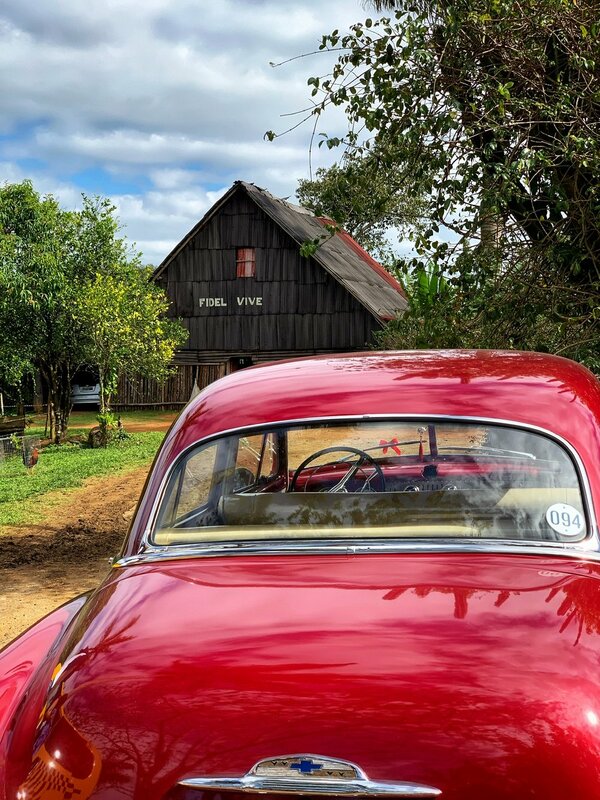 American travelers should expect to plan itineraries heavy on cultural experiences, focused on meeting and supporting local Cubans in the private sector. These types of itineraries align with two of the 12 legal categories: Educational Experiences, and Support for the Cuban People. For me, adhering to an educational and cultural itinerary made the experience more exciting and special than a beach resort vacation. On the outskirts of Havana, and even inside the city itself, what Westerners would view as poverty is evident. And yet there are clear signs of Cuba’s emerging middle class. America has a sharp-elbowed entrepreneurial culture of competitive recognition- and approval-seeking. We are nothing if we are not beating out the competition by winning awards, making headlines — even if just in small-circulation trade magazines — and influencing on social media. Despite the recent economic reforms and a new, thriving tourism-driven entrepreneurialism, American-style entrepreneurial culture is noticeably absent in Havana and the entire island in general. Commercial advertising is technically banned, and with an internet penetration of only 5% for global internet as of 2017, slow and restricted WiFi access, e-commerce sites being blocked, and approximately 3.5 million mobile phones for a population of 11 million*, the reason behind this may be more lack of access to the means of digital marketing than Cuba’s longtime collectivist culture. Still, collectivist culture plays a role: the private sector is heavily regulated by the government, and Cubans, whether it be online or offline, get their information from state media and state-run companies — entities that reinforce a singularly collectivist viewpoint. Restaurants (Paladares), of which there are 4,000+ and growing. These establishments serve up to 50 seats each, and are an example of an area the State has largely exited. Bed & Breakfasts (Casas Particulares), which offer 28,000+ rooms to tourists (vs. 62,000 hotel rooms) and growing. Tourism growth in this area is strong, and State/Joint Venture hotels are near capacity. Co-operatives are also self-governing legal entities. Co-operative farms have existed since the revolution, but non-agricultural co-operatives have only been allowed since 2012 pending a slow approval process. These newly legal non-agricultural co-operatives are restricted to 201 self-employment categories. By statute, co-operatives have access to wholesale markets and can import/export, but this is not yet the case in practice. Agricultural co-operatives (5,500) still dominate, but non-agricultural co-operatives are growing faster (498 approved, 329 operational), including farmers markets, construction, transportation, and light manufacturing. Rest assured, despite the contrasts and very real challenges for everyday Cubans, romance is plentiful. The rum is free-flowing, the sound of Afro-Caribbean music and reggaeton beats permeates nearly every place and experience, and pre-embargo classic American cars still dominate the streets. Havana is a city of unmatched color and vibrance — this feels impossible to change, and I hope it forever stays this way. On the third day of my visit, a road trip from Havana to Viñales Valley — a UNESCO World Heritage Site — highlighted much of the culturally-rich, untouched beauty of Cuba’s caribbean countryside, and the good will and collective spirit Cubans maintain as a key part of their culture: we had to be aware and stop once to allow cows to cross the street, and when asked about the numerous hitchhikers dotting the side of the highway, our local guide explained that picking up a hitchhiker in Cuba is not only safe, but travelers in government cars are required to stop and pick them up. Cuban society is one in which people look out for and help one another. Old meets new when it comes to Havana nightlife and dining out. One of the highlights of my trip was a local chef-lead cooking experience on a beautiful new casa particular rooftop in Central Havana. Americans traveling to Havana should embrace staying in a private-sector casa instead of a hotel, and seek out paladars to dine at. You may have to put up with a power outage or unreliable hot water in your casa, and dishes that aren’t able to be ordered on a paladar menu due to shortages — I did, all three — but you’re directly supporting the private sector, and this experience also helps to highlight the contrast between the Cuban people’s Cuba and the Cuba that exists for tourists. If you want to come away with at least some idea of what living in modern Cuba is really like, this is an easy way to accomplish it. My advice is to seek out as many ways as possible to leave your comfort level far behind. For nightlife that feels more new Havana than old Havana, head to Vedado. Private bars and clubs that feel like they could very easily be in Bushwick, Brooklyn or Shoreditch/Brick Lane, London sit almost randomly among urban residential casas. You more or less need to know about them to go. Throughout our trip we hit La Esencia — housed in an 1880s mansion and one of the trendiest bars in Havana — Fabrica de Arte Cubano, and EFE Bar. Spots like these appeal to both Havana youth and tourists alike. This is where you can clearly experience Cuba flirting with modern vibes and a mixed economy. 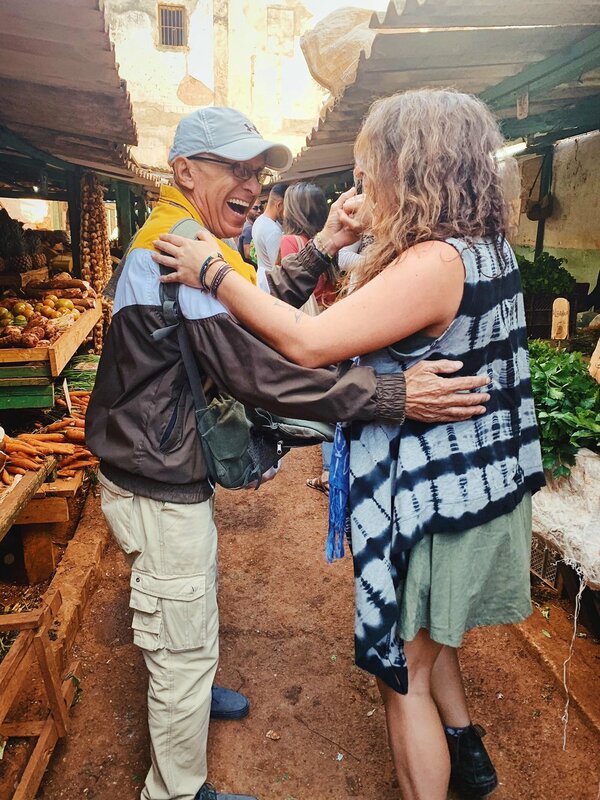 A friend is lead to spontaneously dance with a local man in the middle of a street market in Central Havana. *Sources: Entrepreneurial Activity in Cuba’s Private Sector, 2017, Engage Cuba Coalition.